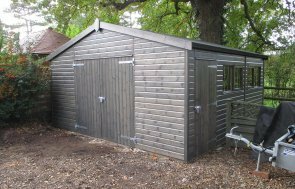 This Timber Garage is 3.6 x 4.8m in size and has been installed in our customer’s garden in Westwell, Oxfordshire to be used as a workshop for his metalwork hobby. The front gable end has got a slight roof overhang and large, double doors that open onto the inside of the workshop area. The benefit for this customer with a garage is that there is no floor, so they will be working on the concrete base without worrying about the weight. There are four windows on each side of the garage to allow plenty of natural light into the building. Four out of the eight windows in the garage can be opened, so as well as light, there will be plenty of ventilation. This building has been constructed using Weatherboard cladding, painted in Black from our Sikkens Paint Palette, while the overhanging apex roof is lined with heavy duty mineralised roofing felt. Black guttering has been added to aid with water collection. 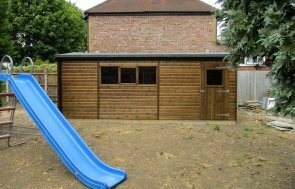 Would like a Timber Garage or Garden Shed in your garden? You can also view the entire collection of Garden Buildings here. We welcome visitors to each of our Seven UK Show Centres, where you can browse a variety of display buildings and get a real feel for the luxury first hand. If you have any queries, please request a callback, contact us or call us on 01760 444229 to speak with one of the knowledgeable team.